Our cub scout troop camped at Mt. Madonna again this summer, and I have to say, I love this park! Even though there are not the conveniences of flush toilets, or on-site general store, we still had a great time. Our steps stir up the earthy smell of leaves and growing things from the leaf litter, as we survey the large group space to choose where to pitch our tent. We pick a relatively flat space, with little or no apparent slope to it. This will prove to be incorrect over the next 2 nights. The campsite is a haven for kids, especially boys seeking "forts" and "hideouts" rather than the Barbie Dreamhouse my sister and I craved growing up. 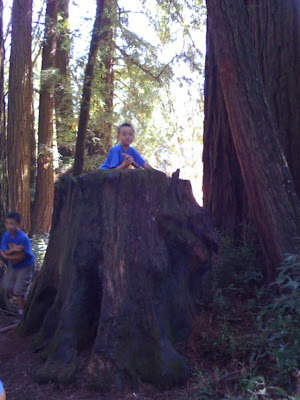 This giant burned out redwood tree trunk greeted us last year. I swear it looks 2 feet shorter than last summer, but DH tells me it just seems that way because our boys have grown so much! I am going to estimate that the trunk is 8 feet high? Definitely taller than our tallest parent, who is over 6 feet. No one fell out this year, thank goodness! This particular tree comes with convenient hand and footholds cut into the tree, and the edges are well worn from years of use. This is the top of another "fort" in our immediate sleeping area. This one stands only 3 feet high, more easily scaled and defended by the younger scouts. Another tree fort--one of 4 "secret" ones in our campsite, hidden among many other trees instead of out in the open. You can see why this place is "adventure" paradise. Capture the flag was played several times over the course of the weekend. They also played a funny game "Zorch," which is apparently a version of Marco Polo played on land, in the DARK. I don't know how they managed not to trip over tree roots and break any limbs, but they had fun. Last year we hiked over to the Henry Miller Estate ruins, and did some geocache exploring. This year the parents were less ambitious--we barely even left our campsite to visit the deer pen next door. Still, DH and I were exhausted when we got home. Much of this I blame on a lack of sleep the whole weekend. Thanks to the mild slope of our campsite, and our shared "queen-size" air mattress, I was rolling into DH all night. I rotated the mattress in the morning 90 degrees, putting our heads above our feet. The next night he kept rolling into me. I wonder if we were to invest in the king-size mattress, which is actually 2 separate mattresses linked together, if that would help? Other excitement this trip--we got through both nights with dry sleeping bags all around, despite several mad dashes for the port-o-potties nearby. One child came back in, sheepishly admitting he had not quite made it all the way. When I started to get up to get him a change of underwear, he told me not to worry about it, his pants were still dry. Yeah, think about that for a minute, you'll figure it out... I was warned not to walk to the right when I exited the tent later on. Speaking of unwanted moisture, it rained again this year! I am pretty sure it was what the rangers call "forest condensation." The fog rolls in off the ocean, and all the moisture clings to the redwoods all around us. As the weather cools overnight, it all condenses and drips off the trees onto us--and sure does feel like RAIN, no matter what you call it! It's a lovely sound on the rainfly but not easy to fall asleep to. Since I couldn't sleep, I found myself checking the tables at 4 in the morning to put things underneath to keep dry until morning. The good news is that having learned from our experience with this "forest condensation" phenomenon last summer, our shoes were all INSIDE the tent this time. Dry feet are happy feet! I am so proud of your outdoor adventures. You are doing spelndid. It probably beacuse of ALL of your camping background...living off the land and all. That looks like a really cool place to camp. We just had Roger's Rock as kids...but I won't complain. I had a lot of great memories there, as I am sure the boys will, too. Maggie and I sleep in speperate air beds when we need to use them. I roll over and toss her in the air if we don't. Amusing to me, not to her. Wow, this sounds like SO MUCH FUN! I never knew giant tree stumps could be used as forts! I have very little camping experience but I am very hungry for it and I hope our daughter enjoys it so we can go many more times! Nice photos! @googoodadda: I hope this weekend has locked in that enthusiasm--we have lots more camping trips ahead of us!